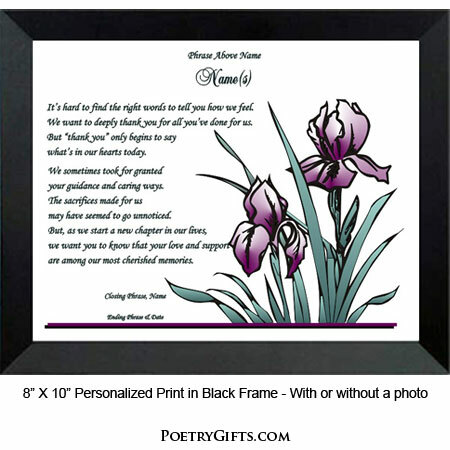 Home > Thank You Gifts and Poems > Thank You Gift for Parents - Personalized from you! 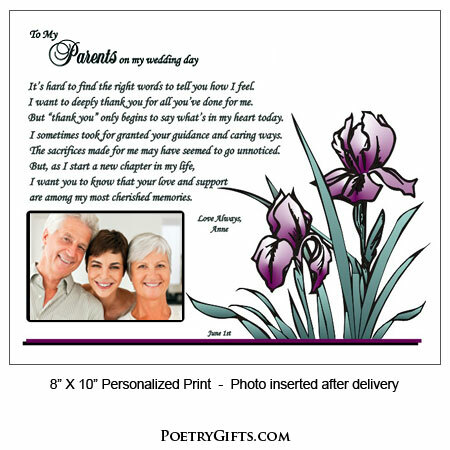 "To My Parents On My Wedding Day"
Wedding gift that tells your parents (Mom, Dad or Mom & Dad) and your father-in-law and mother-in-law how much you appreciate them. This is a great gift to give to your parents as you start a new chapter in your life: marriage, graduation, a new job or any time you want to show your appreciation. The poem is personalized and comes with an optional cut-out area for a photo. An exceptional thank you gift for parents. Need an extra special thank you gift for mom and dad. This EXCLUSIVE Poetry Gift is a "hands down winner!" 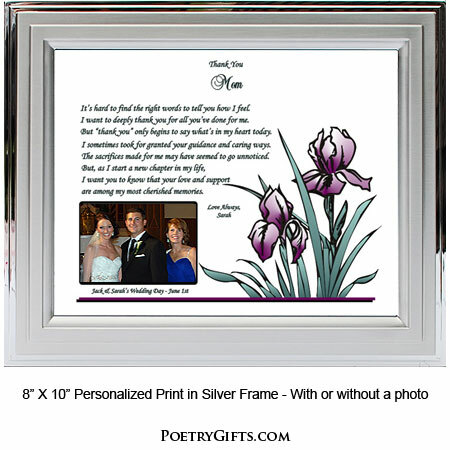 This lovely design is the perfect setting for this heartfelt and sincere poem for mom and dad. We personalize it with names, date, and a closing message. Add a photo of you and him and/or her and you've created a keepsake for parents that they will cherish. How proud they will be to display this wonderful testament of your love and appreciation in their home. 4. Optional Phrase and Wedding Date - (Example: Samantha & Jason's Wedding Day - June 1st; William's Graduation - June 15th)"
OMG! I really needed a way to thank my parents. Glad I found your site. Beautiful. Needed to find a gift for my mom and dad to thank them for helping with my wedding. This was perfect. Bought it in the silver frame and had it placed at their table at the reception. Needless to say there were tears!